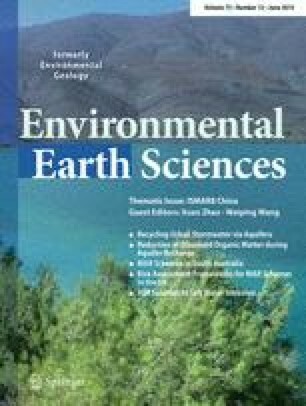 A study was carried out across 86 locations of the country to investigate iodine supply potential of soils, grains and underground waters for onward design of an environmental intervention in Pakistan. Wheat crops were the principal crop in this study since it supplies 75 % of calorific energy in an average Pakistani diet. TMAH-extractable iodine in soils provided a geometric mean of 0.66 µg g−1, far lower than the worldwide mean of 3.0 µg g−1 for soil iodine. Bioavailable (water-extractable) iodine concentration had a geometric mean of 2.4 % (of TMAH-extractable iodine). Median iodine concentrations in tube well sourced waters were 7.3 µg L−1. Median wheat grain-iodine concentrations were 0.01 µg g−1. In most of the grain samples, TMAH-extractable iodine was below detection limit of 0.01 µg g−1. The highest wheat grain iodine was measured on a soil having highest TMAH-extractable iodine. An iodine intake of 25.4 µg a day has been estimated based on median wheat grain iodine measured and groundwater consumption compared to world health organisation (WHO) recommendations of iodine intake of 150 µg a day. This nominal intake of iodine is alarming since 60 % of Pakistani households do not consume iodised salt. The online version of this article (doi: 10.1007/s12665-014-3952-8) contains supplementary material, which is available to authorized users. The authors are grateful to Daniel R.S. Middleton of the University of Manchester and British Geological Survey, UK for his technical contribution in preparation of GIS maps for this research work. All the authors declare that there is no conflict of interest for this research work.